Music is fun when you can listen to every beat and tone. 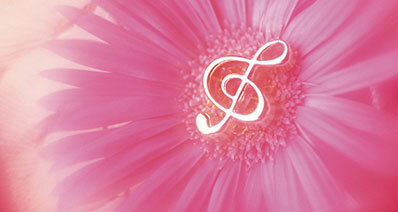 The effect of pure music can create a sensation of passion and enthusiasm. Just like watching a movie or video in High Definition is an amazing experience, to access high quality music is a sensational feeling. Spotify has made this available at a click. All you need to do is follow some simple steps and you can enjoy high quality music at demand. It is available as high as 320kbps on Spotify . But, there are certain limitations to access that high quality streaming. When we talk about music, sound quality cannot be compromised. And Spotify never wishes to disappoint its users making it a favourable choice in the market. Spotify has offered various options for variety of users: from music genres, playlists, artists, membership services, radio stations, music from different times, and the streaming quality of the music they wish to listen to. We will discuss now and then you can improve the music listening experience on your device. You can choose from the available options and quality that suits your network data usage plan and also can fulfil your desire to listen to quality music. Here is what Mac users need to do to get high quality Spotify streaming. The steps are easy and can be carried out by anyone using Spotify. From the music quality section, switch the toggle switch on (turns green) and you get access to high quality music streaming. Click on the edit menu, and select preferences and switch the music quality toggle switch on to listen to high quality music. Please note that this high quality streaming is available for Premium account only. Here are the simple steps if you want to change the music quality on your app. Remember, the better the music quality the better you sound experience will be. So, it is important that you have the highest music bit rate if you’re looking to get the best experience. Bit rate is considered to be a measuring scale to rate the sound quality of any audio or music track. The higher the rate is the better the quality is. But it can be high enough upto a certain limit. Generally high quality music is rated as high as 320 kbps (sometimes to a 480 kbps) while a normal quality music audio would have the bit rate around 160 kbps. 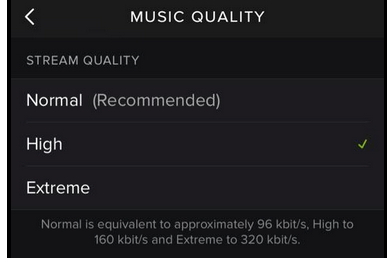 Spotify has made 3 different bit levels available for the users to enhance their music listening experience. All you need to go is follow the following steps. Note: Though this service is available for the premium account users, but free users can also enhance the bit rate but using other applications on the internet (you may call the hack or the backdoor entry). 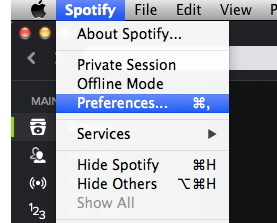 Access your Spotify settings and select stream from the list. • For iOS device users. Select the bandwidth (streaming quality) that suits your needs. You can choose from 2 options : volume normalization or high bitrate. Even though you may switch the settings and enable the bit quality streaming. Please ensure that you have a health internet connection. Using the Spotify services at a poor bandwidth or unhealthy connections would not deliver the expected services and the quality of music may not be that good. Also switching to the higher bit rate means a faster download rate, this implies that the data connection plan you have subscribed need to ensure that high speed data transfer. If the plan does not support that speed, you may feel any difference in the streaming quality. 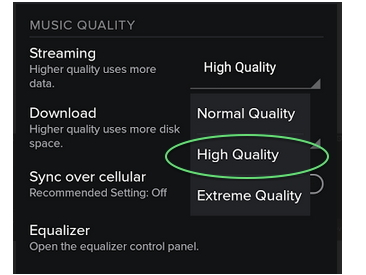 Thus it is recommended to use good, reliable and healthy internet services to use better streaming quality on Spotify. 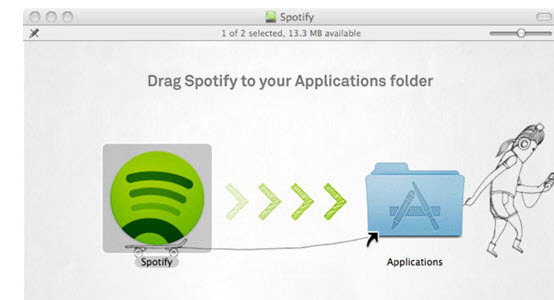 How-to > Streaming Music Services & Sites Tips > How to Get Spotify High Quality Streaming?